‘To Yirrawalla’ is a tribute to the artist Yirawala (1903 - 1976) from the language group Kuniniku of the Arnhem region. Whiteley felt a strong affinity upon meeting him in Sydney in 1971 and viewing his bark paintings. The minimal atmosphere of 'To Yirrawalla' conjures up a late winter scene in a paddock somewhere in the New South Wales central west. The desiccate landscape appears to barely sustain life, apart from tiny birds, insects and exotic blue vegetation. Surprisingly the stream running through the bottom portion of the the picture harbours a life-size platypus, a favourite hyrid creature of Whiteleys, perfectly adapted to its demanding environment. As well, the artist’s deft deployment of stones, a tree branch and collage all play a part in activating or heightening visual intrigue. The only hint of modernity is a bitumen roadway negotiating its way through the top left corner of the painting. 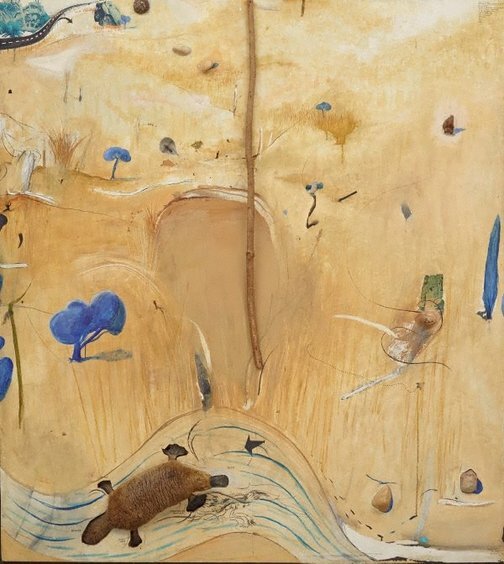 The work was a precursor to such celebrated paintings as 'River at Marulan' 1976 and 'Summer at Carcoar' 1977. Signed and dated l.r. corner, black ink "... Brett Whiteley/ Aug-Sept/ 1972"
Gavin Wilson, Rivers + Rocks : select works of Arthur Boyd & Brett Whiteley , 'Rivers + Rocks', pg. 9-60, New South Wales, 2001, 13 (colour illus. ), 14.